In 2002, a Joint House-Senate Intelligence Committee investigated U.S. intelligence service failures leading to the September 11, 2001 "terrorist" attacks. The Congressional report totaled 836 pages, of which the final chapter -- 28 pages in length -- was and still is completely classified. For over a decade, family members of the 9/11 victims, the co-chair of the Joint Intelligence Committee investigation itself former Senator Bob Graham (D-Fla.), a majority of the members of the 9/11 Commission and other individuals and organizations have urged declassification of these pages, arguing that what is known about them from members of Congress who have read them and gone public indicates that the Kingdom of Saudi Arabia and possibly also Israel are named as having been involved in organizing, financing and protecting at least some of the "hijackers" of the September 11 plot. 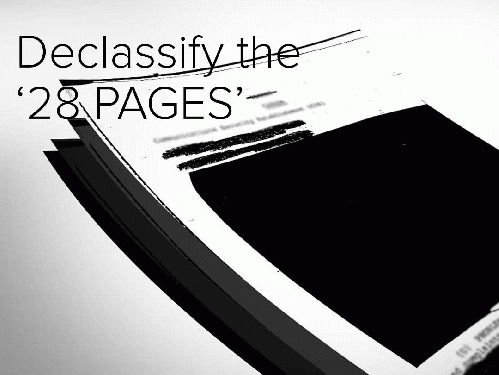 High level calls for the declassification and release of the 28 pages took a quantum leap on April 10, 2016, with a special edition of CBS News' award-winning investigative journalism program 60 Minutes dedicated to the topic as well as Nancy Pelosi (D-Calif.), the longest-serving Democrat on the House of Representatives' Permanent Select Committee on Intelligence, calling for their release in an official statement. However, no American politician wants to bell the cat. And few influential citizens do, either. The cries we hear are for President Barack Obama to "declassify" the 28 Pages, and before leaving for his recent trip to Saudi Arabia he did say that he "favored" their release. Unspoken in this statement, however, are two important facts: 1) if the pages from an executive branch document, President Obama himself is the highest declassification authority in the executive branch and could -- and should -- declassify and release them immediately; but 2) the pages are part of a Congressional branch document and so are "owned" by Congress, which has the sole authority to declassify and release them, which has been unequivocally stated in writing on CIA letterhead; and as Congress as a body has delegated such decisions to the House and Senate Intelligence Committees, the very Committees who wrote the report containing the 28 Pages have the sole authority to declassify and release them at any time -- and the president, as the head of the executive branch, does not. The executive and congressional branches are therefore playing a cynical game of 'good fed, bad fed' with the 9/11 victims' family members and the American people. But even if President Obama had the authority to declassify and release the 28 pages, we don't believe he would do so. Campaigning on ending the war in Iraq, he has, instead, continued it. He has also warred against Libya, Syria, Pakistan, and, by Saudi proxy, Yemen. So, there is little reason to expect that he will let American citizens and the world see how he and the George W. Bush administration have protected countries which have supported international terrorism. BUT " There really is a better way, and one that Congress has used before. There is constitutional and legal justification for this. 3. In Gravel v. United States, 408 US 606 (1972), the U. S. Supreme Court rejected the executive branch's argument and those of lower courts that Senator Gravel and his aides had broken the law. In upholding the immunity of members of Congress under the Speech or Debate Clause, the court clearly stated that the clause "... was designed to assure a co-equal branch of the government wide freedom of speech, debate, and deliberation without intimidation or threats from the Executive Branch. It thus protects Members against prosecutions that directly impinge upon or threaten the legislative process. We have no doubt that Senator Gravel may not be made to answer --either in terms of questions or in terms of defending himself from prosecution--for the events that occurred at the subcommittee meeting." And, in fact, for almost a year now former Senator Mike Gravel has been calling for just one courageous member of Congress to step forward and become "The Mike Gravel for the 28 Pages." He has personally met with Representatives and Senators who have already read the pages asking them to step forward and do what he did, and has sent a law review article detailing how Gravel v. United States and the multiple subsequent court rulings upholding it continue to ensure members of Congress near-absolute immunity should they recite from memory what they have read of the 28 pages on the floor of the House or the Senate. WHO HATES HAITI? The Iraqis Ought To.